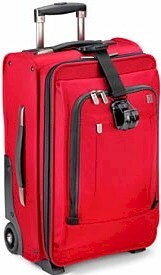 This compact wheeled suiter is great for packing a combination of clothes including your more formal garment. It can also be check-thru the airlines or carried on. The pull up handle on top one end and the 2 roller blade wheels on the bottom make this very stable to roll. Each piece has detachable strap for connecting another piece. On the Outside, this piece is made of the strong Ballistic Nylon. Frames are high density polypropylene with ABS plastic wheel guards. Nickel plated Aluminum one touch pull up handle. Also 80mm in-line skate wheels. Quality features found thru out Swiss Army line. Comes in black or red. All Victorinox pricing includes Free domestic shipping and more. Also, no sales tax if shipped to anywhere outside the state of Michigan. On line ordering is of the highest level secure format. We have been in business for over 50 years and offer 30 day Money Back Guarantee. All Victorinox pieces are backed by Manufacturer's Warranty. We also can gold hot stamp your initials at no extra charge, just specify desired initials under "Special Instructions" when placing order.